Separator, as the one with highest technical barrier among four major raw materials of lithium battery, is the only remainder that still has not been completely made in China yet, particularly the wet-process separator which has been much sought after over the recent years. Howbeit, the gap between demand and supply is narrowing amid the technological advancement and capacity expansion of Chinese separator enterprises. In 2016, China’s output of separators posted 929 million m2, an upsurge of 33.03% on an annualized basis, and seeing a rising share of 56% in global total. 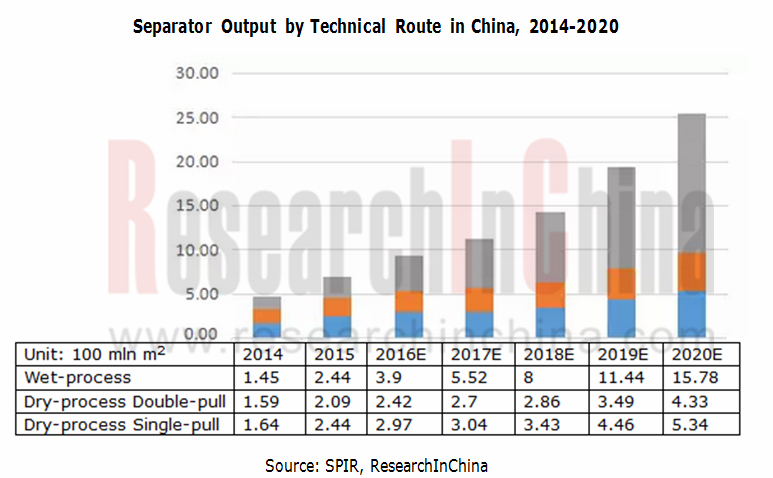 The localization rate of separators was lifted to 79% in China in 2016, but the high-end separators still relied upon imports. In the past five year, the average price of home-made 16μm wet-process separator fell from 9.5 yuan/m2 in 2010 to 5 yuan/m2 in 2016; and that of 16μm dry-process separator dived from 7.5 yuan/m2 in 2010 to 3-4 yuan/m2 in 2016. The slump in price is mainly caused by rapid capacity expansion of low- and medium-end separators as well as the price war staged by players to seize more market share. Furthermore, there are low- and medium-end overcapacity and disorderly competition in the downstream battery cell industry, which brings room for low-end low-priced separators. Although the huge low-end capacity (mainly dry-process separator) of Chinese separator manufacturers lowered the average selling price of separators worldwide in the past five years, the demand for high-end wet-process separators will see explosive growth along with the continuously growing demand for power battery in the world, and the separator firms with low technical level and small production scale will be ultimately eliminated. Since 2017, separators of all kinds, without exception, have experienced fall in price, while high-end wet-process and dry-process separators saw a narrow decrease in price. Nevertheless, the high-end dry-process separator has small production capacity and finds limited application. Being with a descending trend, global separator price drop will be substantially narrowed compared with the fall during 2014-2016, mainly because the wet-process sees a rising proportion as wet-process separators accelerate to be used instead of dry-process ones in power battery. In 2016, Shenzhen Senior Technology Material sold 120 million m2 of dry-process separators, ranking first in China, followed by Cangzhou Mingzhu Plastic Co., Ltd and Xinxiang Zhongke Science and Technology (GREEN) Co., Ltd. In 2016, the sales leader of wet-process separator came to Shanghai Energy New Materials Technology Co., Ltd, and it sold 100 million m2, with customers covering Samsung, LG, BYD, CATL, etc. In 2016, the top three by wet-process separator sales in China were Shanghai Energy New Materials Technology Co., Ltd, Suzhou GreenPower New Energy Materials Co., Ltd, and Foshan Jinhui Hi-tech Optoelectronic Material Co., Ltd.
Against the growing demand for wet-process separator in recent years, Chinese wet-process separator manufacturers are expanding production capacity aggressively and the originally dry-process separator producers also have made investments in wet-process separator production lines. At the end of 2016, Suzhou GreenPower New Energy Materials Co., Ltd is the Chinese producer with the biggest wet-process separator capacity up to 204 million m2. Besides, the dry-process leaders Xinxiang Zhongke Science and Technology (GREEN) Co., Ltd and Shenzhen Senior Technology Material Co., Ltd built some wet-process separator capacity, adding their separator capacity to total 170 million m2 and 156 million m2 respectively at the end of 2016. Top 9 Global lithium battery separator manufacturers (operation, technologies, markets, production and marketing trends). 7.1 Xinxiang Zhongke Science and Technology (GREEN) Co., Ltd.
7.5 Jiangxi Xian Cai Nanofibers Technology Co., Ltd.
7.7 Suzhou GreenPower New Energy Materials Co., Ltd.
7.8 YiTeng New Energy Technology Co., Ltd.
7.9 Liaoyuan Hongtu LIBS Technology Co., Ltd.
7.11 Henan Huiqiang new energy material technology Corp., Ltd.
7.12 Tianjin DG Membrane Tech. Co., LTD.
7.14 Foshan Yingbolai Technology Co.,Ltd. 7.16 Hebei Gellec New Energy Science&Technology Co.,Ltd. 7.17 Sinoma Science & Technology Co., Ltd.
7.19 Jiangsu Jiujiujiu Technology Co., Ltd.
7.20 Nantong Tianfeng New Electronic Materials Co., Ltd.
Technical Parameters of Lithium Battery Separator of Nantong Tianfeng New Electronic Materials Co., Ltd.